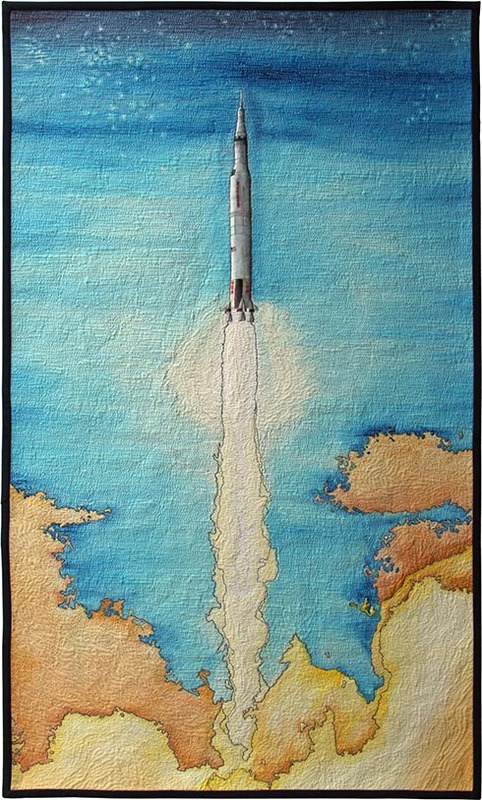 This quilt is part of the Fly Me to the Moon exhibit, a traveling exhibit celebrating the fiftieth anniversary of humans traveling to the moon. The piece commemorates the launch of the Apollo 8 on December 21, 1968, crewed by Frank Borman, James Lovell, and William Anders. Over the course of six days, they travelled out of Earth orbit to the moon, reached and orbited the moon ten times, then returned safely to earth. They were the first to make this trip; their mission demonstrated its viability, and was an important prelude to actually traveling to and landing on the moon. All contents © 2019 Tanya A. Brown. All rights reserved.